Please enter a value between 1000 and 1999999. Please enter a value between 1000 and 2500000. So we can email your quotation. We'll call and discuss your quote. Get an all-inclusive fixed price quote. Checkout online, there’s no payment required upfront. Complete the initial forms and get going. Located in southern England at the source of the Hogsmill River, Epsom is a market town in the county of Surrey. It has a population of over 30,000, and a good selection of housing ranging from contemporary flats to beautiful detached homes. At My Home Move Conveyancing we’ve been developing our knowledge and expertise of the local property market since 2001, helping us to deliver an outstanding specialist, fixed fee conveyancing service to our clients in Epsom. You’ll need to instruct property lawyers to complete the legal work on your behalf when buying or selling property in Epsom. By choosing My Home Move Conveyancing to be your Epsom conveyancers, you can make the most of our award winning customer service, which we combine with an innovative use of technology to deliver more completions per year than anyone else. Our conveyancing service comes for a fixed fee, so there are no hidden costs to worry about, and you can plan exactly how much you’ll be paying from the outset. Moreover, if you don’t end up moving for some reason, you won’t have to pay us anything. We assign all of our clients a dedicated conveyancer, who’ll act on your behalf from start to finish, providing you with regular updates on the progress of your case. You’ll enjoy a consistent point of contact, and a high level of expertise. At My Home Move Conveyancing we supply our professional conveyancing services in Epsom to homebuyers across the local area, from those looking for a contemporary flat close to the centre of town, to others searching for a spacious detached family home on the outskirts near Horton Country Park and Long Grove Park. The average house price in Surrey is £444,583, while in Epsom the overall average sale price over the last year was higher than this at £481,229. Most sales involved flats, which went for an average of £296,097. Semis sold for £523,239, while detached properties fetched £748,109. With a long history as a Saxon manor and then as a Georgian spa town, Epsom has been known at different times for its salts and horse racing. With plenty of green spaces in the area, the town’s a popular place to live thanks to its close proximity to London. There are plenty of modern amenities which locals can take advantage of, including the Ashley Centre shopping mall and the Ebbisham Centre. Epsom has great transport links for getting into London, with trains to the capital’s Victoria and Waterloo stations taking around 40 minutes. The M25 motorway is around six miles out of town, and can be reached in about 15 minutes by car. When you want to go on holiday, Heathrow Airport is around 15 miles from Epsom, while Gatwick is a similar distance away. There are some excellent schools in the area for families with children to consider, with primary options including St Joseph’s, Southfield Park and Epsom Primary on Pound Lane. Glyn School, Epsom College and Blenheim High School are among the choices at secondary level, while the University for the Creative Arts has a campus in Epsom. All properties in Epsom will fall within one of the following council tax bands. Established in 2001, we exclusively deal with the legal side of moving home. Last year alone, through our experienced conveyancers, we helped nearly 50,000 customers have a hassle-free experience. We are a truly national company, having completed transactions in each of the 109 postcode areas in England and Wales. We understand that moving house can be stressful. So we make sure everything we do makes the process as easy and efficient as possible. We’ll give you an all inclusive fixed quote from the start so there won’t be any surprises. The price only changes if your instructions do. You’ll have access to our unique, easy to use, online case management service to track your case. And dedicated conveyancing experts who’ll be on hand to guide you through the whole process. We know you’re busy, so we’re open 8am until 8pm most weekdays, and open at weekends too! Finally, if your move falls through, through no fault of your own, we won’t charge you a penny in legal fees. Zo has been amazing throughout this house sale. We were acting on behalf of my Mother-in-law who had to leave her family home due to ill health. The support we received from Zo was instrumental in ensuring it went through as quickly as possible without any problems. All questions/requests via email,phone call or via the companies easy to use website were answered in a timely manner. I would recommend this company and especially Zo to anyone thinking of moving home. Vikki has been excellent and we so happy with the service we have received from her and My Home Move Conveyancing. I would highly recommend their services to friends and family! Efficient and much easier than having to keep going to a solicitors office to sign papers, you can move things forward in real time. Very little has to be posted, most things can be uploaded. They are always available to speak to and very professional. Danielle and Hayley who were my two dedicated conveyencors were excellent. Used twice and would always now use. The whole process from start to end was efficient and professional. We were particularly impressed with Vikki Keith, easy to access and always willing to answer any questions we had. She also ensured we were kept informed through out the process. Will not hesitate to use the service again when we purchase our next house. See why our unique conveyancing service (My Home Move and its wholly owned law firm) has been recognised as an industry leading, award winning conveyancing company. 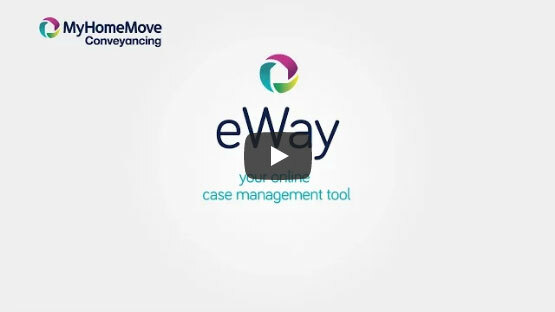 Our innovative online case management system, eWay, allows you to keep track of your progress, make payments and complete documentation 24/7 via a smartphone, PC or tablet. Or you can download our iOS and Android app. Watch the video below for more information. As soon as your offer has been accepted, your estate agents will send us a copy of the Memorandum of Sale, giving us the details of the property, the offer and the seller. It’s likely that you have already spoken with a mortgage provider and possibly even received an offer in principle – a statement to say how much the mortgage company is prepared to lend you. Now it’s time to turn the offer in principle into a solid offer. You’ll need to let the mortgage company know that you have made an offer, how much the offer is and give them the property details. You might also want to consider getting a survey done. This will vary in price depending on whether you opt for a basic survey, known as a homebuyer’s report, or a full structural survey (which is strongly recommended if you’re looking at an old or listed building). We will request the contract pack from the seller’s conveyancer and we will also order any relevant searches e.g. Local Authority, Drainage, Environmental or Coal mining. We will raise enquiries with the seller’s conveyancer, and we will send you a report. This will contain information about the title and a preliminary draft of the contract for you to sign. You should read the contract carefully, sign it and return it to us. When your mortgage lender makes an offer, they will send us a copy. This is so we can check through any special conditions and verify whether the details held by the lender are correct. We will send you a report and some paperwork for signing. Once any outstanding issues with the searches, mortgage and enquiries are resolved, we're going to need your deposit. Usually the contract will stipulate that a deposit of 10 per cent of the purchase price passes from the buyer’s conveyancer to the seller’s conveyancer. This is a financial deterrent to stop buyers pulling out of a deal between exchange and completion. If a buyer pulled out at this stage they would forfeit the full 10 per cent deposit to the seller. If you are buying and selling simultaneously we would normally use the deposit received from your purchaser to pass on to your seller, and the same will happen all the way along the chain. Even if a reduced deposit is paid on exchange, the full ten per cent becomes immediately payable in the unlikely event of completion being delayed. When the contracts have been exchanged you have reached the point of no return. You are legally obliged to buy your new home and your seller is legally obliged to sell it to you, on the set completion date. On the day of completion we will send the balance of the purchase price, including the money received from your mortgage lender, to the seller’s conveyancer by telegraphic transfer. Once this has been received by them we will call you to let you know that you can pick up the keys (which are usually with the estate agent). As soon as a sale has been agreed, your estate agents will send us a copy of the Memorandum of Sale, giving us the details of the offer and the buyer. If we've already got your completed starter pack we'll obtain a copy of the title and send a draft contract to the buyer's conveyancer. We'll also a send a copy of the draft contract for you to sign. You need to sign this copy of the draft contract and return it to us. If there is anybody else living with you who isn't named on the title, they will need to sign the contract too. This is to show that they agree to move out on completion. If you have a mortgage on your existing property, we will contact the lender to obtain a redemption statement. And if you have any additional loans secured on your existing property, we'll also need to contact those lenders. Once the buyer's conveyancer has checked through the draft contract, and the associated paperwork, they will contact us to raise enquiries. We will answer their questions from the information you provide in the starter pack. But we might need to give you a ring to discuss some of the questions. When all the details are sorted we will agree a completion date and will exchange contracts with the buyer's conveyancer. This is when it all becomes legally binding. Once contracts are exchanged both seller and buyer are legally obliged to complete on the date set. If your buyer has paid a deposit this can't be released to you until completion. Depending on how the contract was negotiated, this deposit will be held by us or by the buyer's conveyancer. Now that we have a completion date, we can get an exact final redemption statement from your existing mortgage lender (and for any other loans you might have secured on the property). On the completion date, the buyer's conveyancer will send us the balance of the sale price by telegraphic transfer. As soon as the funds reach our account, the transaction has completed and you will need to be out of the property. We will send your signed transfer and title deeds (if there are any) to your buyer's conveyancer. We will pay the balance outstanding on your existing mortgage (and repay any other loans you might have secured on the property). At this point we will take our fees out of the proceeds and also pay your estate agent's fees. The next working day, we will send the balance (whatever's left from the sale price after redeeming loans and mortgages, and paying the legal fees) by telegraphic transfer to your designated account. After we have received your instructions to act we will check the legal issues and title to your property to ensure it offers a satisfactory security for your new lender, as this is the essence of a mortgage. We will also check the amounts outstanding on any current mortgage registered on the property as these will have to be repaid at completion. The amounts will be confirmed with you. Usually, we will not carry out Local, Drainage or Mining (if appropriate) searches as we will put in place an insurance which will protect your lender. This is less expensive for you and quicker. Some lenders still require that searches are made and will not rely on insurance. If this is the case the searches will have to be made and the cost will show on the Financial Statement sent to you. At about the same time that you receive your Mortgage Offer we receive a copy together with the lender’s instructions to act for them. We will consider the Offer to ensure that we do those things required of us as the solicitors and to check what other conditions have to be satisfied. We will then send you the Mortgage Deed to sign and any other documentation that may be required by your lender. We shall need to have this back from you as soon as possible and certainly by the day before we complete. Otherwise there will be a delay. You need to check that the Mortgage Offer is acceptable to you. For example, is the mortgage amount and mortgage product correct? Is it the correct method of repayment? Are there any early repayment fees? We target a completion date for 7 days after we receive our copy of the Mortgage Offer but our being able to complete depends on the terms of the Offer and any peculiarities of your transaction. If the new mortgage amount is less than the amount we have to pay to your existing lender, we will ask for the difference from you, before the completion date. Following completion we deal with the registration formalities to ensure the mortgage security is perfected for your lender and any deeds will then be sent to your lender for safe-keeping. Request your landlord to confirm that all ground rent, service charges and insurance premiums (if applicable) have been paid to date and that there is no known breach of the lease. Have to approve the wording of the lease. Have to serve on the landlord a notice of discharge of your existing mortgage and a notice that a new mortgage has been given to your new lender. PPL is the largest residential conveyancing law firm in the UK and employs over 300 conveyancers. As such, our combined experience levels amount to over one thousand years. We currently have 38 Licenced Conveyancers, 70 Solicitors and 13 Legal Executives. Although this has no impact on your quotation, please note that we also carry out conveyancing transactions which are referred to us by various third parties, who are often paid a referral fee for making the recommendation. The amount of the referral fee varies, but the average is £252.82. © 2019 My Home Move Conveyancing | My Home Move Conveyancing is a trading style of Premier Property Lawyers Limited. Premier Property Lawyers is regulated by the Council for Licensed Conveyancers. Practice Licence Number: 11315. Premier Property Lawyers Ltd is registered in England and Wales. Registered No: 04323405. A list of the directors is available from the registered office. VAT number: 231 822924. You must be over 18 years of age to generate a conveyancing quotation.